When undertaking a vacation to Walt Disney World’s theme parks, many families usually generate long lists of all the various experiences they’d like to tackle – and most, if not all, of these items are usually exclusive to the resort (such as, say, catching a particular character breakfast or, of course, hopping on a specific ride). It turns out, however, that there just may be something a little more (comparatively) humdrum that you should also think about doing while on-property: catching a movie. Why should vacationers spend their time doing something routine thousands of miles away that they can do equally well back home? Well, for starters, scheduling down-time is a mandatory part of any on-site stay, and, especially for those individuals who are able to be on property for several days (or more), having a nice balance of activities is actually more rewarding. But much more than all this, there’s also the little fact that going to your local theater isn’t equal to the experience that you can receive at Disney World. AMC Disney Springs 24 is the resident movie theater at Disney’s Orlando resort, and it has a few tricks up its sleeve for your cinematic viewing pleasure – the most recent of which is its brand-new offering of Dolby Cinema. We got the lowdown on everything AMC 24 has to offer from both AMC and Dolby, and we’ve laid it out for you below in three specific points. 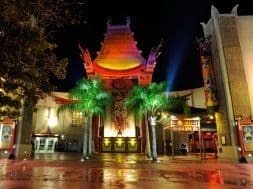 Consider these the three big reasons why you should watch a film at Disney World. We think they lay out a pretty compelling case. Let us know what you think in the comments below or, even better, over at our brand-new Disney-centric Facebook community. When the cinema originally opened in 1988 as AMC Pleasure Island 8, it was – as the name would suggest – part of Pleasure Island, that stretch of more adult-themed entertainment that would officially open the following year and would ultimately be shuttered in 2008. The theater stuck around, however (as did most of its retail and restaurant neighbors), and is now officially part of Disney Springs’s Landing area. 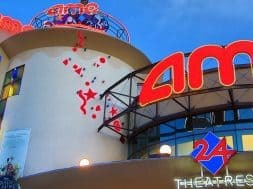 But more than just the name has changed over the years – AMC has been consistently committed to updating and otherwise upgrading its Disney location on the inside, as well. The original eight auditoriums were expanded to 10 almost immediately, in 1989, and then they ballooned to the current 24 in 1997. More recently, in 2011, six of those screens were upgraded to the full-service Dine-In feature, which necessitated the adding of a full kitchen to the building – one of the very first AMC theaters across the country to do so. 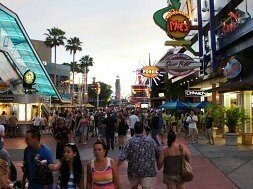 Don’t feel like waiting in line at The Edison for that drink and bite before catching a film? No problem – AMC offers guests several different ways to enjoy dinner and a movie. You’re able to have food delivered right to your movie-theater seat once you’ve ordered it from the concession stand, or you can just push the Japanese-style service button next to your chair and order from a bigger menu (one that encapsulates appetizers, entrees, and desserts and also features the company’s new Feature Fares). And, of course, if all of that fancy stuff is just too much for your popcorn-and-soda sensibilities, you can simply get your snacks the old-fashioned way, at the concession stand, and carry it yourself, the old-fashioned way, to your specific auditorium. The last reason to spend your hard-earned vacation dollars at AMC Disney Springs 24 is also the newest. Let’s quickly go over each of these upgrades. On the audio front, there’s a new object-based system that incorporates overhead speakers, allowing filmmakers to institute dynamic sound that flows all around you (the official name for this is Dolby Atmos). Visually, Dolby teamed up with Christie, the famed projector manufacturer, to create an image that is “spectacularly” more vivid than the standard movie-theater quality, with truly bright brights and dark darks (dubbed Dolby Vision, its contrast ratio is 1,000,000:1). And, finally, Dolby Cinema incorporates a new design philosophy, ranging from the spatial (such as new recliners that “pulsate with the action”) to the technical (a refined audio-visual pathway) – what the company calls Inspired Design. Dolby Cinema is now available at AMC Disney Springs 24. 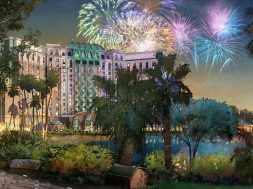 For even more on Walt Disney World – and all the rest of Orlando’s attractions, including Universal Orlando Resort – be sure to follow Orlando Informer on Facebook, Twitter, and Instagram.